Color, cut, extensions! You name it, Audrey wants to learn it. “When I get older, I want to go to school for cosmetology because I like uplifting other people’s self-esteem – hair, makeup, massage, all of it,” she said. She’d like to be a business owner one day with the goal of opening up her own salon. The 14-year-old who’s in foster care will be in the 9th grade in the fall of 2018. When it comes to school, she really likes reading and writing. She also enjoys science. “You get to hands-on experiments sometimes, and that’s the best way for me to learn,” explained Audrey. Her teacher describes her as a leader who participates in class. “I like being around people, just not so many people,” she smiled shyly. “I have a nice sense of humor, and I’m very supportive,” she added. One of the things that makes her unique is that she’s double-jointed! She’ll show that off proudly if you ask her…holding her hands together with her arms criss-crossed and wrapping and un-wrapping them around her body like a pretzel. She enjoys cooking, playing Yahtzee, riding her bike, listening to music, and doing crafts. She’s a fun, creative type of person. “I like art because of all the different art pieces in the world, and it just supports individuality,” she explained. “Most teenagers feel like they have no hope in life because they’re at that age where there’s a lot of judgmental people out there. And they feel they have to be perfect for society, and in reality nobody’s perfect,” she said. “What I’m looking for in a family is a good communications system and a bonding experience. I actually would like to do a lot with my family that I haven’t been able to do before – you know, all the family activities,” said Audrey. “The top three things a family must have is…patience, you must have acceptance, and you must have love for everybody,” said Audrey. If you’d like to learn more about Audrey, click here. 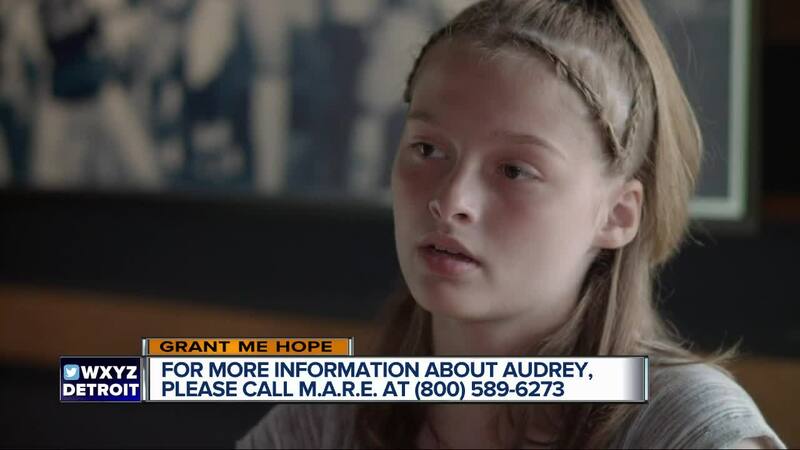 If you’d like to learn more about adopting or fostering Audrey, please call the Michigan Adoption Resource Exchange at (800)589-6273. You can always help Michigan foster children’s dream of being adopted by sharing these Grant Me Hope videos on social media. Thank you!